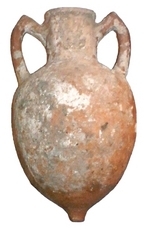 This is a small amphora, to a certain extent resembling a much-shortened version of the Rhodian type. The peaked handles are attached to a comparatively wide neck, while it has a short and ovoid body ending in a smallish stub and a simple, rounded rim. The Aegean region? (Sciallano & Sibella, 1991). Rome, Switzerland (Sciallano & Sibella, 1991).